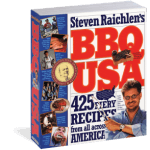 Author, chef and TV host, Steven Raichlen has been spreading the gospel of BBQ since the late 90’s. Few people have a more established name in the world of grilling. He has published over 25 books, and his works have been translated into 15 different languages. Coming in at 774 pages, Raichlen’s BBQ USA: 425 Fiery Recipes from All Across America is a massive work that covers regional recipes and cooking techniques from across America, with a few recipes from Canada and Puerto Rico thrown in for good measure. More than a simple cookbook, however,BBQ USA puts the recipes in context while exploring the history of BBQ. Raichlen leaves few stones unturned in this book, and it won’t take you long to find some inspiration to fire up the grill. BBQ USA starts its epic journey with some grilling basics. Raichlen gets you in the right mindset by discussing different kinds of grills and accessories while going over some tried and true grilling techniques. From there, he delves into the – excuse the pun – meat of the book. Going coast to coast across America, Raichlen covers just about every BBQ recipe and grilling technique worth talking about. Highlights include the “Mojo-Marinated Pork on Sugar Cane” from Florida and the “Alabama BBQ Chickens with White BBQ Sauce.” Alongside the recipes and grilling methods, Raichlen shares anecdotes, bits of history and tradition, profiles of some of the most well known BBQ figures, and photos of chefs, markets and BBQ joints. Throughout the book, Raichlen is committed to sharing a sense of place that goes beyond simple descriptions and basic recipes. You likely won’t find a more exhaustive work on American BBQ. The treasure trove of recipes is reason enough to pick this up, but the stories and history are what really make this work stand out. It’s also a nice change of pace to see pictures of BBQ joints and chefs in action, rather than the typical collection of finished plate photos. While this is as close as you will get to a comprehensive resource on grilling in the U.S., BBQ USA is not without its flaws. Some of the pages feel cluttered, and if you are just browsing for a recipe, it can be difficult to focus. Also, the book may have missed the mark in organizing sections by food types. It would be considerably easier to navigate the pages if the book was organized by state and region. Whether you are a BBQ novice or a veteran grill-master, you will find BBQ USA to be a valuable resource. Despite the cluttered appearance of certain pages and a somewhat unintuitive system of organization, BBQ USA will be a welcome addition to your library, and you will be able to reference it for years to come.